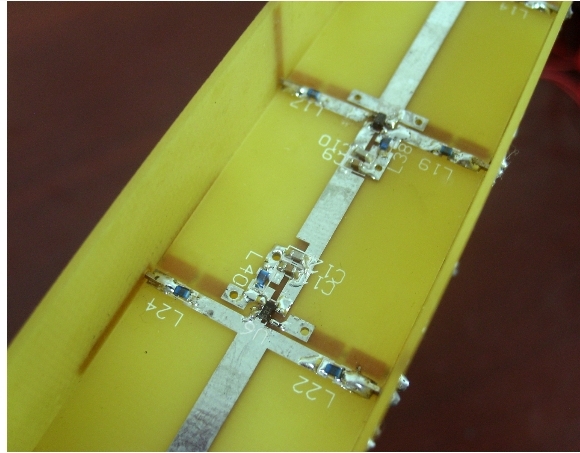 To prevent microwaves passing through it from reflecting backward, a new 'metamaterial' uses antennas of alternating orientations (top) that are connected by amplifier circuits (bottom). Computer chips that use light to move data would be much more energy efficient and possibly even faster than today’s chips, which use electricity. One of the difficulties in realizing them, however, is that light moving through a “waveguide” — unlike electrons moving through a wire — can reflect backward, interfering with subsequent transmissions and even disrupting the operation of the laser that emitted it. Today’s optical networks keep light from reflecting backward with devices called isolators, which are made from exotic materials like yttrium indium garnet and work only when a magnetic field is applied to them, which makes them bulky. But since isolators absorb light particles — photons — to prevent them from scattering backward, they also diminish the strength of forward-moving optical signals. In this week’s Proceedings of the National Academy of Sciences, researchers at MIT, Zhejiang University in China, and the University of Texas at Austin describe a new “metamaterial” that keeps photons moving in only one direction, rechanneling the stragglers rather than simply absorbing them. Although the prototype is large, it doesn’t require the application of a magnetic field, so it could, in principle, yield optical components much smaller than today’s isolators. Moreover, building a chip-scale version of the metamaterial would require no materials more exotic than the metals already used in microprocessors, reducing manufacturing costs. Wang’s co-authors on the paper are MIT physics professors Marin Soljacic and John Joannopoulos; Lixin Ran and Zhiyu Wang of Zhejiang University; and MIT graduate students Jingyu Wang, Bin Zhang and Jiangtao Huangfu. 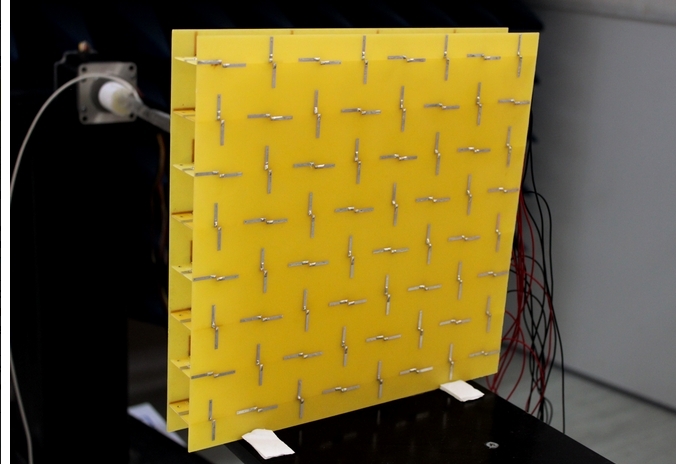 What gives the researchers’ new material its light-herding properties are rows of embedded metal antennas that look rather like small, twin-blade propellers of alternating orientations, vertical and horizontal. Each antenna is connected by an electrical circuit to an antenna of the opposite orientation on the bottom surface of the material; the direction of current flow through the electrical circuits determines the direction in which electromagnetic waves will propagate. In the prototype, the antennas are embedded in a pair of circuit boards about an inch apart, but in a chip, they could just as easily be embedded in silicon. Indeed, miniaturizing the antennas is not the chief obstacle to getting the metamaterial to work at visible-light or even near-infrared frequencies. The operating frequency is also limited by the switching speed of a transistor in the electrical circuit, and no known transistor design yields a switching speed high enough for visible light. “It’s pretty exciting work,” says Shanhui Fan, an associate professor of electrical engineering at Stanford University. “It’s addressing an important problem.” While researchers are investigating a number of different approaches to chip-scale waveguides, an optical version of the new metamaterial could be particularly useful in the manufacture of the on-chip devices that control optical signals. Though the back-reflection in such devices can be mild, it compounds when a number of them are used in sequence. “That turned out to be quite an issue if you need to cascade many of these devices together,” Fan says.